Proper exterior and landscape lighting needs to balance several key factors in order to achieve the best results. You want to create enough light outside to have enjoyable nighttime usage of your yard that enhances the beauty of your property without looking utilitarian. You want to light your favorite outdoor spots, so you can clearly see without adding so much light that you miss the natural quiet and calm from the dimness the evening hours bring. You want enough light for safety without generating unnecessary light pollution and without giving your neighbor another reason to complain. You want lighting that will flow with your current house, landscaping, and structures to increase curb appeal instead of fixtures that stick out like a sore thumb. Let’s face it, bad lighting makes a backyard as attractive as a warehouse parking lot, good lighting helps you to enjoy your property at night, and great lighting becomes an extension of a beautiful house, magnifying your beautiful landscape, and inviting guests to explore your whole property during a warm evening. The sad thing is, poor lighting can cost you as much as great lighting if you hire the wrong people to install your lighting. This is where we like to think we give you something better. The secret is in planning your lighting more than it is in the fixtures themselves. You see, on the Rasevic team, we have full time landscapers, full time luxury home builders, and full-time designers and decorators. We can bring any of the talents you need together to ensure you have outstanding exterior and landscape lighting. We can ensure there is continuous harmony between your interior home lighting, the exterior lighting on your house and other structures, along with all of your landscape lighting. Too many landscapers install exterior lighting with only the landscaping in mind, creating discontinuity with the rest of the property. Why would you want to go through the effort of adding landscape lighting to make it clash with your home lighting? Instead, you want to look outside your back-patio door and feel as if it is the next room of your house, inviting you to relax in the cool evening breeze after a long summer day. 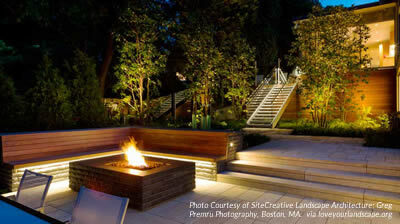 You want your party guests to step out onto your patio during an evening gathering to see how your landscaping is just as gorgeous at night as it was during the day, not with utility lights that wash out your gardens’ beauties, but with carefully appointed lighting to draw out the beauty hidden in the daytime. If you have kids, you want them to have a safe place to play in the evening with lighting that is so seamless with the rest of your property that you only notice the lights when they are turned on. So, what is your next step? We are in Bethesda, so if you are in the Washington D.C. or Greater Baltimore Area, how about you call us for a free consultation regarding your landscape lighting? We are always happy to give you our input free of charge because we know you deserve a landscape that is as inviting, useful, and safe during the night as it is during the day. Give us a call today!